GBC offers over 70 years experience in designing and producing top-quality shredders. GBC personal shredders come with a complete one-year warranty (with five years on cutting heads), and GBC has the industry's only on-site factory service program plus hundreds of servicing dealers. Personal shredders are designed for low volume shredding and are not intended for continuous operation. They feature a thermal cutoff device that automatically shuts the shredder off if it runs for an extended period of time.
. Attractive - Modern designs blend into any office environment.
. Convenient - All models accept stapled documents, feature Auto On/Off and reverse function to clear overloads.
. Secure - Choose from straight-cut or higher security/bulk reducing cross-cut models. "The Powerful personal shredder is ideal for heavy individual use." The GBC Shredmaster 950S has a unique design that fits easily next to desk or in any narrow space. 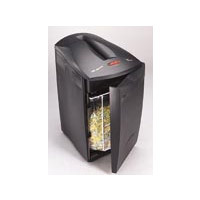 Shredmaster 950S is a strip-cut shredder that shreds 12-13 sheets into 0.25" chips at 15 feet/minute, including staples. It comes with an extra large 9 gallon cabinet that hides shredded waste. 9.25" throat handles all letter size documents. Indicator light informs operator when door is open or shred bag is full. Auto On-Off for convenient one-handed operation. Reverse function clears overloads. Motor features a thermal cut-off that prevents overheating. 6 feet power cord. Available in charcoal. Limited one year warranty; five years on cutters. Shipping Weight - 28 lbs.